G.Skill announced they have set a new DDR4 memory frequency record of 4255 MHz using 18-18-18 timings.. The achievement was accomplished by Shamo using an ASUS Rampage V Extreme motherboard and an i7 5960X processor, all under LN2 sub-zero cooling. 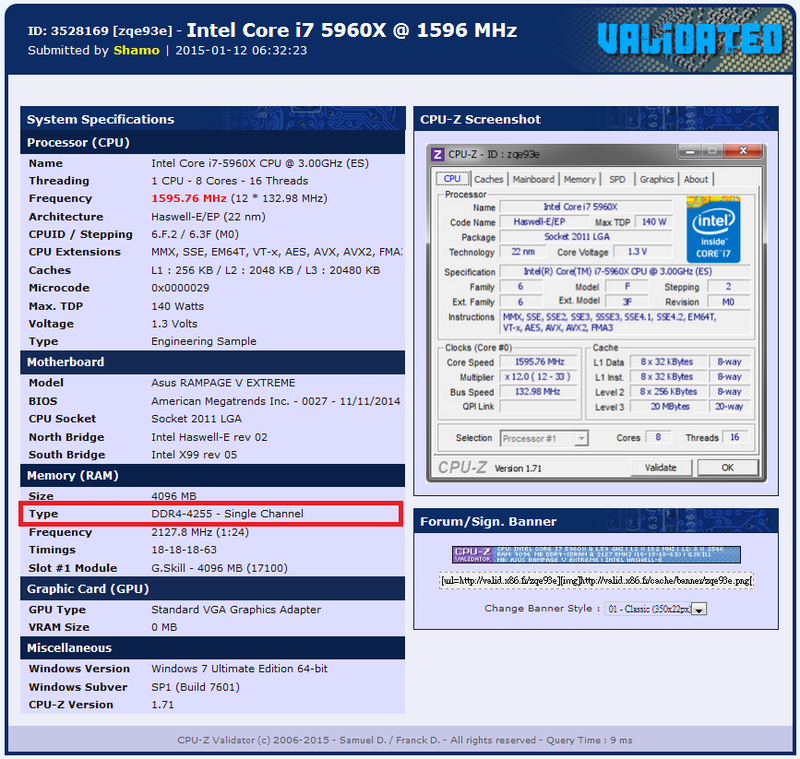 Here is the screenshot of the CPU-Z validation, or you can visit this link. This type of feat is nothing new for G.Skill as they have held numerous memory frequency records over the years. This particular record will certainly be topped as the DDR4 memory platform continues to improve in the future. We’re already seeing very impressive overclocking results with DDR4 even in it’s early stages. It’ll be interesting to see what transpires in the coming months! That is what this is... a 1/4 race, not a daily driving 24 hours of Le mans. Still if you see how DDR4 are acting and how many setups can't pass ~3400 memory clock ( also best memory series around ) then 4255MHz is impressive even using one memory stick. I doubt we will see fully stable DDR4 above ~3600 on X99 platform but soon we should see Intel Skylake and I know some memory manufacturers are already preparing for that.